But wait, would you like to meet the main villain of TAGAP 3? The Funky Warlord is the commander of PDOD (Pluto Department of Defence) – which means that during wartime he has the supreme authority over all operations of Pluto. So, not only does the Funky Warlord organise and command all of the armed forces, but he also gives mandates to all the other departments to pursue. Before the war the Warlord focused entirely on safeguarding Pluto via defensive measures. However, when the word of the planetary demotion reached Pluto, the citizenship was outraged, demanding an action to be taken. Still determined to look for peaceful solutions, the Warlord assembled a reconnaissance operation, trying to determine if this demotion was of hostility or simple ignorance. However, after the intelligence unit returned from its mission with several captured artefacts, the Warlord became obsessed and convinced that the only way forward was war. The Warlord's determination, the intelligence unit's alarming depiction of Earth war-obsessed society and the Funky Prophet's prophecy convinced the Pluto Conclave to go a head and declare the war. It remains unclear what turned the Funky Warlord from a proponent of peace to a fervent figurehead for an interplanetary war. 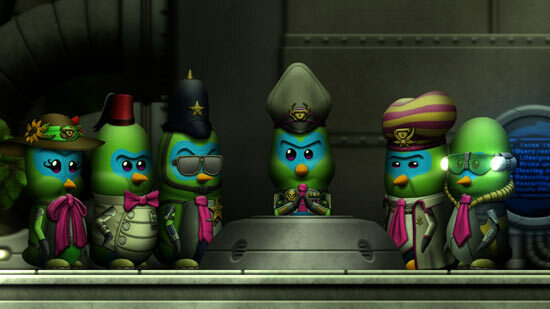 Whether it was commitment to the Faith and the new prophecy or something revealed by the artefacts discovered in the reconnaissance mission, the Funky Warlord is completely dedicated in subjugating Earth – as well as wiping PDOR (Pluto Department of Revolution) and Pablo off the face of Pluto. 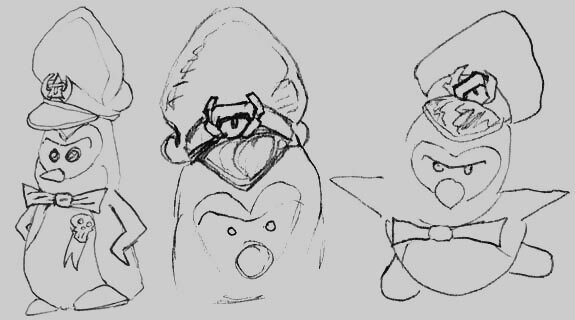 The design of the Warlord was a character study of a typical medal-laden despot in a penguin form. Unlike the rest of the cast, just to shake things up, the detail work of The Warlord was designed directly in Photoshop. Speaking of detail work, do you recognise those medals on his chest? PDOD, or Pluto Department of Defence, is the war and defence arm that operates and oversees all military actions and functions of Pluto. While Pluto has been completely peaceful ever since the formation of the Pluto Conclave, PDOD has always been an integral part of the society. Beneath PDOD are five military sub-departments; The army, the air-and-space command, the navy, the exo-force for off-world operations and the top-secret military science unit. In addition these, each sub-department contributes to an off-the-books intelligence unit – the one most recently responsible for Earth recon operations and the capture of Pablo. When the war with Earth was put into motion, by the founding charters of the Pluto Conclave PDOD became the de facto overseer of Pluto's functions. Whilst all the departments retained most of their autonomy, their guiding goals shifted towards aiding the war effort. For example PDOH still operates Pluto's entire healthcare system, but its research and development leans towards field medicine and biological warfare. PDOD is setting those goals, but its completely up to PDOH how to get there. The war effort has brought PDOD from a background organisation to a tangible presence in life on Pluto. In addition to all departments following PDOD's guidelines and the ever-growing military might being impossible to miss, army soldiers have been embedded to all the departments. The purpose of these soldiers is two-fold; To protect the citizens when the proverbial guano hits the fan and to provide a visible deterrent for dissidents – especially PDOR. What? The above wasn't enough? Just kidding; Naturally the work on TAGAP 3 continues. I'm now doing re-play passes through the game – that is, keep playing through the game, writing issues down and fixing them. Additionally, as we get closer to the release, I decided to start updating all dependencies, like APIs and their SDKs. In the process I noticed that Firelight Technologies has discontinued FMOD Ex, the sound engine used for TAGAP and TAGAP 2. It is replaced with their new, streamlined FMOD Studio, with their FMOD Low-level API working as FMOD Ex Programmer's API equivalent. Naturally I updated TAGAP 3 to support the new, up-to-date FMOD 5 API. Fear not, this was the easiest API porting job I've ever faced. After installing the dependencies, it took me about 10 minutes to get the new sound engine working smoothly. The new FMOD does have a different license, though, requiring us to have the FMOD logo on the splash screen – which is only fair. Funnily though, implementing the logo took longer than the whole porting job. Thank you all for supporting Pablo's world conquest over all these years – it means a lot to us!